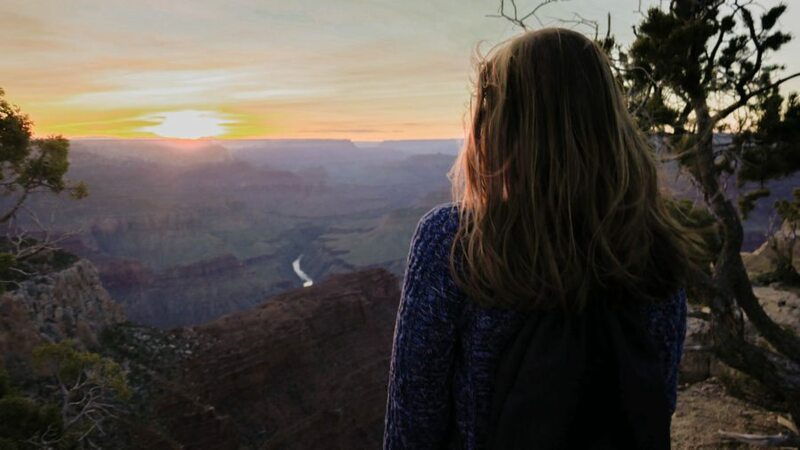 Despite being absolutely spoilt with amazing landscapes and views before our trip to the Grand Canyon National Park I was still impressed with the Grand Canyon, especially with the sunset that we saw on our first evening there. The sheer scale of the Grand Canyon, Arizona is almost impossible to comprehend. What that does mean, however, is that there are absolutely tonnes of things to do in the Grand Canyon National Park. 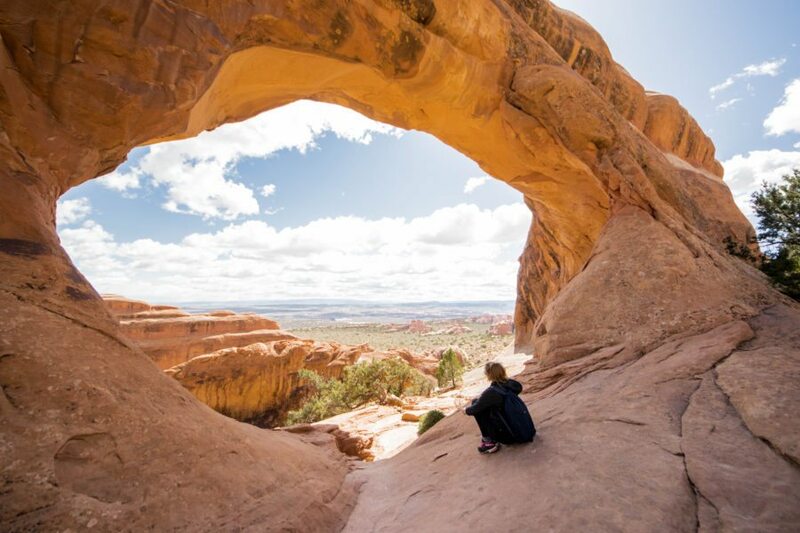 From viewpoints to mule rides, helicopter tours and fantastic hikes, you’re sure to love it. 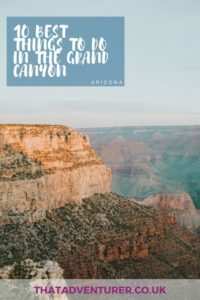 If you’re planning a trip to the Grand Canyon here are some of the best things to do in the Grand Canyon South Rim. The Grand Canyon South National Park Rim is 60 miles north of Williams, Arizona. The whole of the Grand Canyon’s location is within the state of Arizona and about 81 miles away from Flagstaff, Arizona. 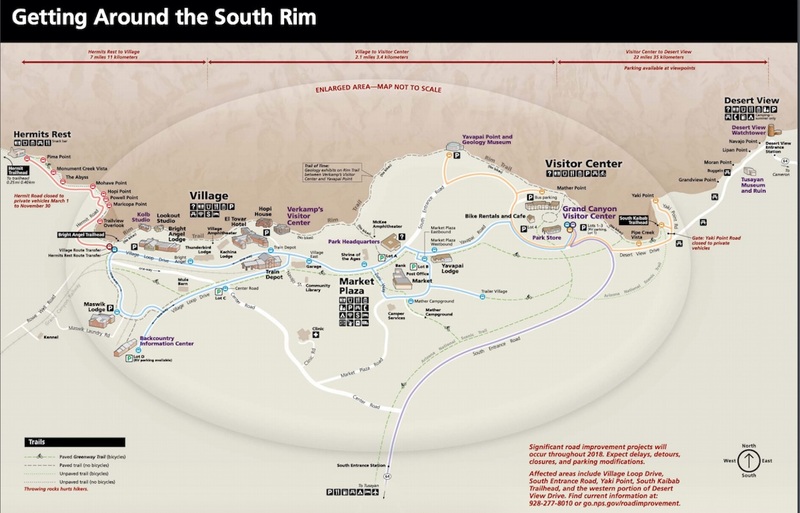 Here’s a map of the main viewpoints and attractions at the Grand Canyon South Rim. You can also now buy your Grand Canyon National Park pass online, or at the visitors’ centres to the following towns: Williams, Flagstaff and the Tusayan National Geographic Visitor Centre (IMAX Theatre). 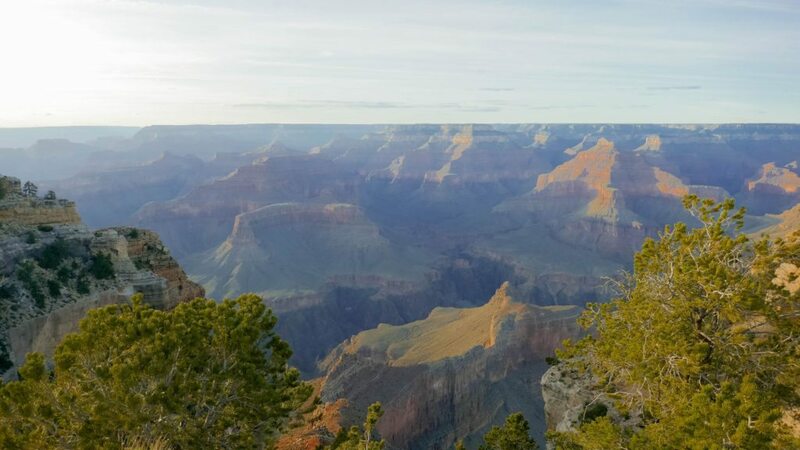 The good thing about the Grand Canyon being such a popular tourist attraction is that there are a lot of places to stay both within the National Park perimeter or just outside too. The best place to stay in the Grand Canyon is within the National Park itself! Here are the hotels inside the boundaries of the Grand Canyon South Rim. These Tusayan hotels near the Grand Canyon South Rim are all highly recommended on Booking.com. Best Western Premier Grand Canyon Squire Inn: Great Grand Canyon lodging at the South Rim just 10 minute’s drive away from the entrance and 5 minutes’ from the Grand Canyon National Park airport. The Grand Hotel at the Grand Canyon: 5-star hotel with great décor and an onsite, indoor pool. Dumplin Patch B&B: Gets great reviews and includes an awesome breakfast! There are three Grand Canyon South Rim camping areas which allow you to go camping in Grand Canyon South Rim. There’s Mather Campground, Trailer Village and Desert View Campground. The first two are within Grand Canyon Village and Desert View is 25 miles to the east. Mather Campground: Reservations recommended, no RV hookups, $18 per site, per night. Trailer Village: Has RV hookups, book here. Not owned by the National Parks Service (NPS) so has a few more amenities. Desert View Campground: First come, first served (no reservations), $12 per site, per night, no electric hookups. Camp spots usually full by 12 pm. Closed in winter. If the campsites inside the Grand Canyon National Park are full then there are plenty of other RV park and campgrounds just outside the Grand Canyon South Rim. Ten-X Campground: Just 4 miles south of the Grand Canyon South Rim entrance. Standard, non-electric sites are $10 per site, per night. Suitable for RV and tents. Grand Canyon Camper Village: In Tusayan, there’s the Grand Canyon Camper Village which is privately owned. RV sites with hookups available. There’s plenty of free camping near the Grand Canyon. Check out this post to see how to find free camping in the USA. Are you looking for some Grand Canyon South Rim Tours? Taking a tour is a great way to see the Grand Canyon if you’re short on time or are travelling around the USA without a car. Some of the most popular and best Grand Canyon tours are those by helicopter. Grand Canyon Helicopter tour at the South Rim isn’t exactly cheap but it is a once in a lifetime experience that’ll blow you away and make a truly memorable Grand Canyon vacation. 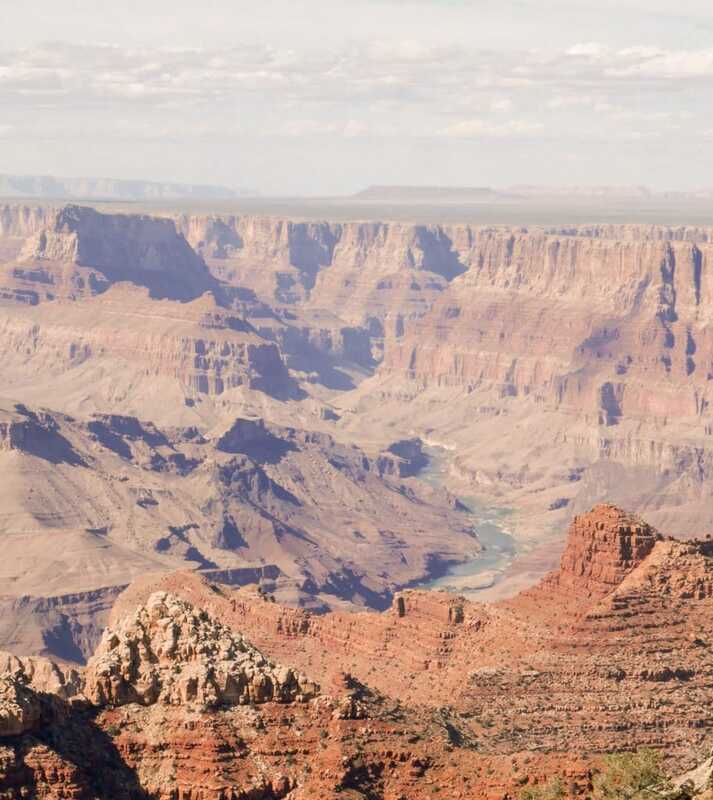 Check out this 5* rated helicopter Grand Canyon tour. 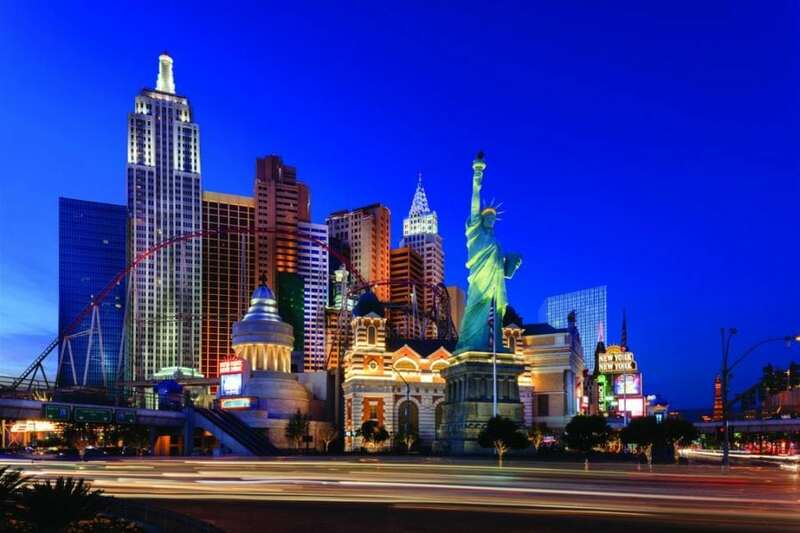 If you’re visiting Las Vegas and haven’t hired a car you can do a day trip from Las Vegas to Grand Canyon South Rim. 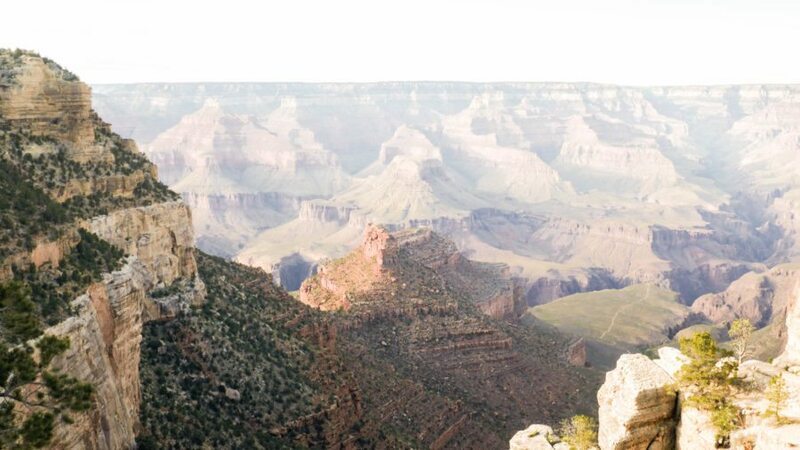 Taking a tour like this makes it super easy to visit the Grand Canyon from Las Vegas. Here’s one of the top picks for a Grand Canyon day trip or take a look at the others below. One of the biggest Grand Canyon tourist attractions is the Skywalk which is at Grand Canyon West. 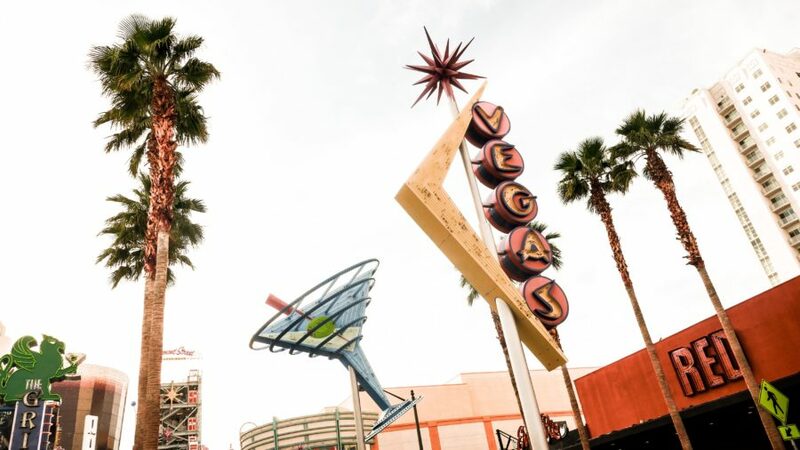 If you’re travelling from Las Vegas you may want to take this tour that picks you up and drops you off in Vegas and takes you to the Skywalk. Alternatively, you can get your Skywalk tickets here. 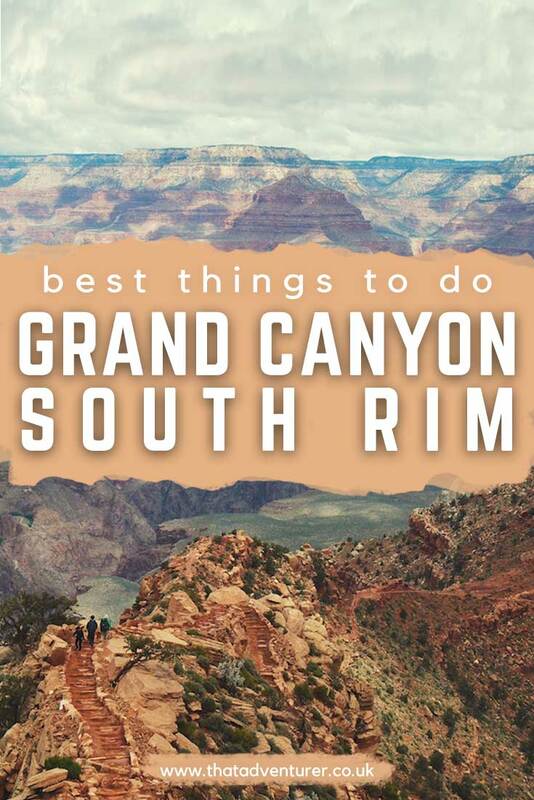 If you’re wondering what to do at the Grand Canyon South Rim then look no further! Here are the top 10 things to do based on our experience. For those of you wondering what to see in the Grand Canyon in one day then check out this list. As long as you don’t want to do a long hike then you can do pretty much everything else below. Consider this as your Grand Canyon trip planner. One of the most enjoyable parts of your Grand Canyon trip will be the incredible views! We entered the Grand Canyon’s South Rim from the East which meant the first part we got to was the Desert View which is one of the best views of the Grand Canyon. 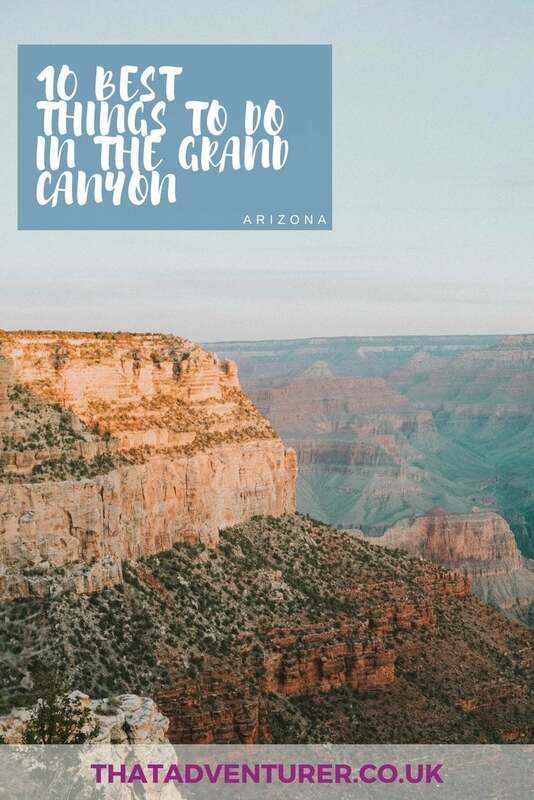 It’s a pretty good place to start your Grand Canyon experience that’s for sure! At Desert View, there’s a 70ft tall Watchtower that gives you some great views of the Grand Canyon and gives you a better size of its scale. From the top, you can see over 100 miles away on a clear day! The Watchtower isn’t an original which is slightly disappointing, but it’s still cool. 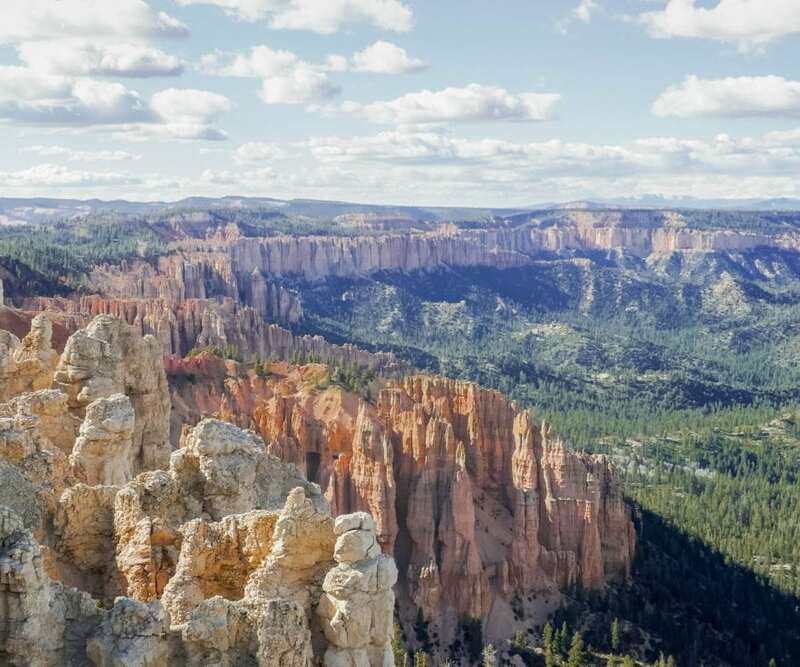 It was designed in 1932 and is a replica of prehistoric towers that have been found in the Colorado Plateau. You can’t go visiting the Grand Canon without taking a little walk along the Rim Trail. Whatever you do, make sure you stay in the Grand Canyon for sunset. 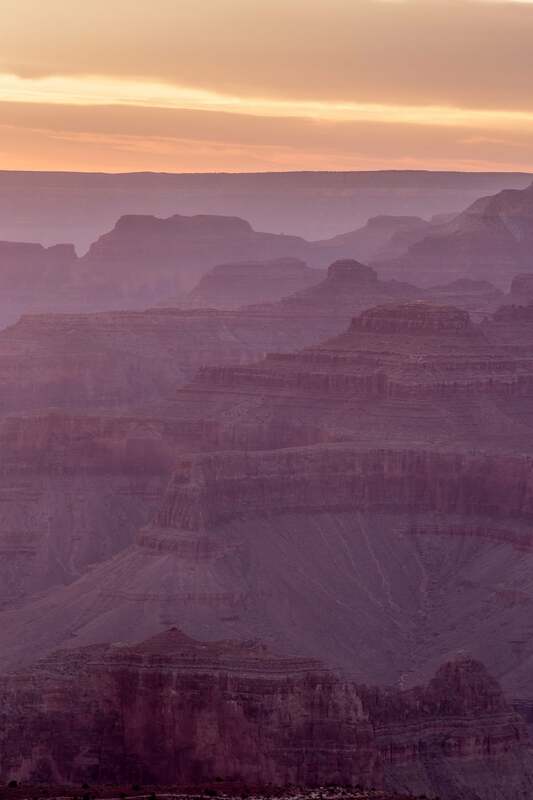 The sunsets are seriously impressive and it’s definitely one of the best things to do in the Grand Canyon. We watched the sunset over by Hopi Point (one of many brilliant Grand Canyon viewpoints) to the west of the South Rim but you’ll get a pretty good view wherever you are. Oh, and don’t leave straight away. Some of the best colours come out once the sun itself can’t be seen anymore! Either book a night at one of the Grand Canyon’s lodges or stay just outside and head in early to catch the sunrise. It’s likely to be less busy than sunset but it’s more than worth the early wake-up call. You can only get to Yaki Point on foot; you’re no longer allowed to drive right up to it. That doesn’t mean you have to walk far for the view though! From here you’ll be able to see Bright Angel Trail, a section of the Tonto Trail and a fine view of much of the South Kaibab Trail as it descends along Cedar Ridge. One of the best Grand Canyon activities is to go hiking! But, don’t take hiking into the Grand Canyon lightly, the climb back up is pretty steep so make sure you’re ready for it. It also gets extremely hot so take plenty of water and suncream! 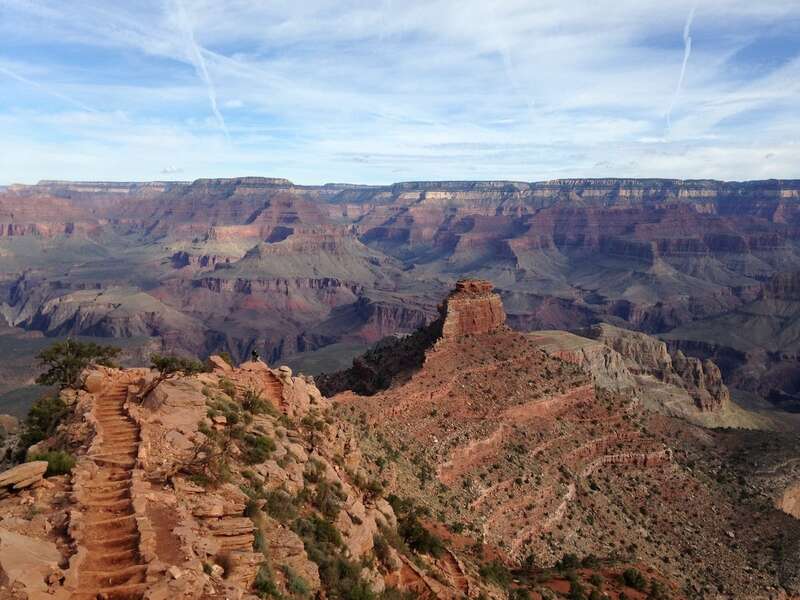 We hiked part of the South Kaibab Trail which is one of the best Grand Canyon South Rim hikes. You can see more of below and read about here. Another option for hiking into the Grand Canyon is to take a mule ride. There are 1 hour and 2-hour trail rides through the pines of the Kaibab National Forest available. Or, you could opt for a twilight campfire and wagon rides! The drive down to Hermits Rest has some of the best scenic views of the Grand Canyon’s South Rim. During most of the year, the road is closed to cars so you’ll have to take the shuttle bus which is free and runs pretty regularly. Make sure you get off and take a walk at some points too! There are quite a view outlooks over the Canyon that cannot be accessed by car but which can be reached by bike. Plus, it’s pretty cool to say you’re biked in the Grand Canyon. Check out Bike Grand Canyon for more info. 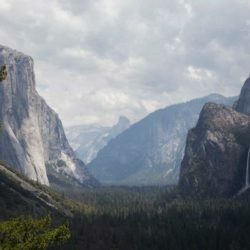 Planning on visiting more National Parks in the US? Take a look at these guides.